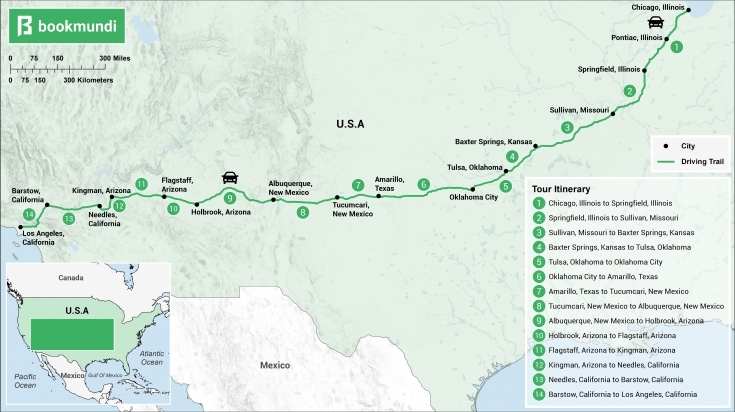 A tale of American resilience, the US Route 66 covers 8 states in 14 days. 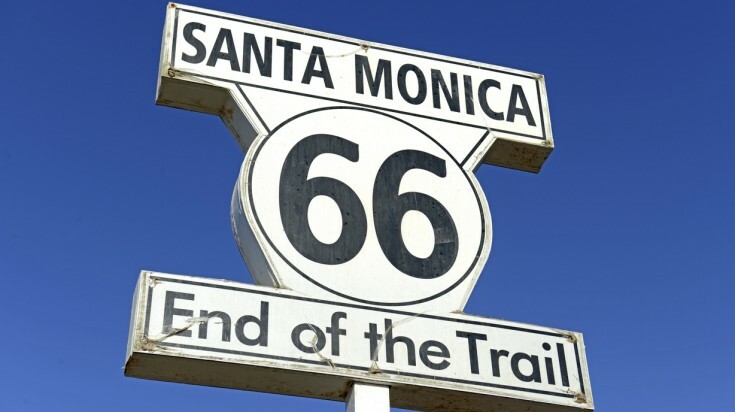 Route 66, affectionately known as “The Mother Road”, spans across three time zones, starting from Chicago, Illinois and travelling all the way down to the Santa Monica Pier in Los Angeles, California. A journey across Route 66 takes you back to the time when many families drove across the country in the 1930s to put food on the table and chase their dreams. Since then, the Route has become the essence of the American spirit. A road that runs through the heart of the country, Route 66 tells the quintessential American story of freedom, mobility, and exploration. It’s a road trip that celebrates the legacy and resilience of the American people. A road trip across the Route 66 is like learning the story of the American people — from where the country began many years ago to how the country looks at present. 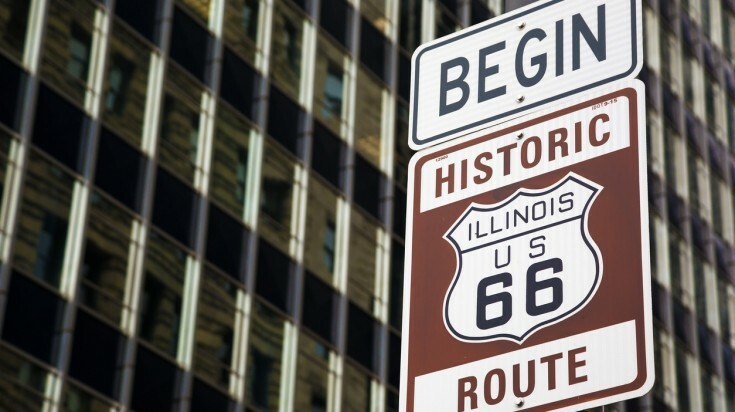 Here is everything you need to know if you are planning a road trip along the US Route 66. 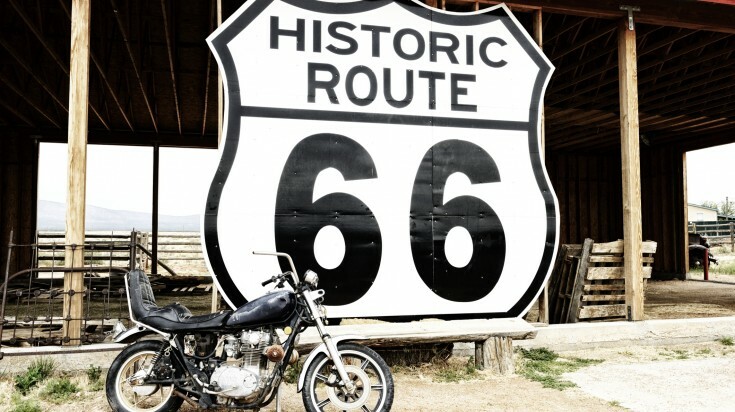 Established in 1926, Route 66 was the first transcontinental highway of its kind. The unique architecture of a highway that ran diagonally across the country became the pulse of America. Route 66 became a sought-after route for the trucking industry and many families who migrated west during the Great Depression. Perhaps most importantly, it served as the primary route for those who traveled west to rebuild during the Dust Bowl of the 1930s, which greatly damaged the ecology and agriculture of many American communities. As the highway grew more popular, Route 66 became a place of economic stability for families who took up business along the byways. In the years that followed, it became the lifeblood and “road of dreams” for many Americans. Explore Route 66 and the heart of America in two weeks, where it’ll take you from the heartland of Chicago and all the way to the sparkling west coast of California. Along the way, discover the places that have stood the test of time and represent the very soul of America. This is where it all begins. The Mother Road starts at either Jackson Boulevard at Michigan Avenue (the original starting point of 1926) or alternatively at Jackson Boulevard at Lake Shore Drive (since 1933). Head over to Lou Mitchell’s (serving since 1949) for lunch for the perfect send-off onto Route 66. From Chicago, Route 66 heads southwest to Pontiac, where you can find the Route 66 Hall of Fame and take a break over the historic Swinging Foot Bridges. Continue down to Lincoln, named after the famous president, where you can explore many sites, including where President Lincoln practiced law, the Lincoln Heritage Museum and a giant statue of the President himself. Finally, end your first day in Springfield with dinner at the Cozy Dog Drive-In. Learn more about the 1908 Race Riots while visiting the restored 1920’s Mahan’s Filling Station. Embark onwards toward St. Louis, passing through Staunton and the famous Henry’s Rabbit Ranch and Route 66 Emporium. Make your way to the Chain of Rocks Bridge, the famous mile-long bridge which carried traffic over the Mississippi for decades before it was closed to traffic. It’s well worth a detour to take a walk across the bridge, now open to bikers and pedestrians. Now that you’re officially in Missouri, make your way to St. Louis and grab lunch at Eat Rite Diner before heading to the iconic Gateway Arch. End your day in Sullivan where you’ll find the famous Meramec Caverns. These caverns were formed from limestone deposits eroded over the years, with artifacts dating back to Pre-Columbian Native Americans. Meramec Caverns is famous for being one of the most visited caves in Missouri and a landmark destination for those coming into the state on Route 66. From the caverns, continue along Route 66 into the city of Cuba, also known as “Route 66 Mural City” for its vivid paintings telling the story of the city’s incredible, rich history. Grab breakfast at Shelly’s Route 66 Cafe in Cuba before heading towards the city of Rolla. In Rolla, discover takeaways from the Mule Trading Post, a popular souvenir shop that has been open since 1957, and the Totem Pole Trading Post, another souvenir and snack shop that has been in business since 1933. Continue onto Devil’s Elbow and over the Devil Elbow Bridge, into Waynesville and the Trail of Tears. Cruise down the highway and spend time in Springfield, Missouri where you’ll find many reminders of the Route 66 era with neon signs, billboards, the 1926 Gilloz Theatre and the Route 66 Car Museum. Finally, end your day in Kansas. Although Route 66 only covers 13 miles of the state, take some down-time at ‘Cars on the Route’ in Galena and grab a bite at ‘Angel’s on the Route’ in Baxter Springs. Both were original Kan-O-Tex service stations - the roadside diners, souvenirs shops and fueling stations - that served many families during the Route 66 era. Continue along to Catoosa. Be sure to make a stop at the iconic Blue Whale, one of the most recognizable attractions of Route 66. Grab lunch at Clanton’s Cafe, the oldest family-owned restaurant on Route 66 (around since 1927), before heading towards the diverse city of Tulsa. Once in the city of Tulsa, you’ll find a lot of what’s left of Route 66 preserved in the city. Explore the remarkable architecture of the Art Deco buildings of the 1930’s and Route 66 signature spots such as the 1925 Blue Dome gas station, the 1916 Cyrus Avery Bridge and the Route 66 Historical Village. End your night with dinner at El Rancho Grande and some live music at Cain’s Ballroom. Call it a night at the Desert Hills Motel, which dates back to 1953 (its neon signs are still intact!). Get an early start through Oklahoma from Tulsa and drive your way down to Sapulpa. Drop in for a visit at the historical Frankoma Pottery (who’ve been selling handmade pottery since 1933), Rock Creek Bridge, and the former Teepee Drive-In Theater. Enjoy a burger at Happy Burger before heading out of Sapulpa. Make your way past the Seaba Station Motorcycle Museum, a 1921 gas-station-turned-motorcycle-museum in Warwick, and head toward Arcadia. Peek into the Oklahoma County 66 Auto Trim and Mini Museum, an artistic collection of replicas of many classic Route 66 icons such as the Wigwam Motel and the Catoosa Blue Whale. Moving ahead to Oklahoma City, make a stop at Pops, a neo-modern gas station and soda gem. Spend the rest of your day discovering the many historical museums and highlights of the city. From Oklahoma City, drive with an empty stomach to El Reno, a city known for its American gastronomy and Route 66 eateries. It is home to the original fried onion burger, birthed out of the Depression era. Grab the classic bite at the oldest burger joint Robert’s Grill, which has been serving onion burgers since 1926. After, make your way slowly to Clinton, and check out the Oklahoma Route 66 Museum. Don’t forget to make a stop at Mohawk Lodge Indian Store. The store dates back to the late 1800’s and delivers some of the most authentic Native American goods in the country. Grab dinner in the historical 1925 Clinton Country Club dining at White Dog Hill. Wrap up your Oklahoma travels in Elk City, home to the National Route 66 Museum Complex. Here you’ll find the all-you-need-to-know guide of Route 66, from its route, to its history, to the states it covers. Say one more farewell to Oklahoma by making your way to Pony Bridge, made famous by the 1939 film “Grapes of Wrath.” Head over to the Texas state line to end your day by checking out Shamrock’s Tower Station and U-Drop Inn, a marvel of Depression-era Art. Continue on and find your evening rest at Amarillo. Start your day exploring Amarillo, the largest city in the Texas Panhandle. Take a drive through Cadillac Ranch, an art installation of 10 half-buried Cadillacs in the Texan desert. Time travel back to the classic days of Route 66 on 6th Street. The district spans thirteen blocks along 6th street in San Jacinto Heights district between Georgia and Forrest Avenues. It was developed in the 1900s as a streetcar suburb and became a road as part of the Ozark trail highway system in 1921. You’ll find many vintage services stations and 1920s to 1940s architectural buildings lining the streets, including stores, shops and the Ranchotel Historic Motel. From Amarillo, drive down to the city Vega and find the restored 1920’s Magnolia gas station and Dot’s Mini Museum, which consists of many personal artifacts of the Route 66 period. Hop your way over to your next state of New Mexico, the Land of Enchantment. Along the way, you’ll end up in Tucumcari, a city that remains true the Route 66 spirit. The city is known for its 2,000 motels. Spend your night among the many historic Route 66 motels such as the Blue Swallow, Motel Safari and Pow Wow Inn that all boast the iconic Route 66 neon signs. Don’t call it a night before you check out the 1930’s Art Deco theater, The Odeon, and see what’s playing! Head to Santa Rosa and dine at the Route 66 Restaurant before taking the pre-1937 route through Santa Fe from Santa Rosa. Drive through the scenic north of Romeroville and head to the state capital of Santa Fe. The city is most renowned for its art, with an abundance of museums, galleries and street art to choose from. Check out the historic La Fonda Hotel, Museum Hill and the galleries that line Canyon Road. 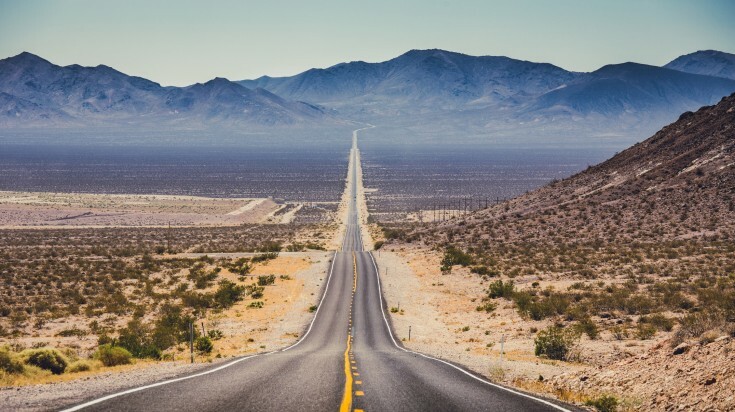 Resume the route to end up at Albuquerque - the longest stretch of Route 66. Travel down historic Old Town, Sandia Peak Tramway, Tingley Beach and the Albuquerque Museum. Catch a movie at KiMo Theatre and spend the night at the Enchanted Trails RV Park and Trading Post in a 1950’s or 1960’s vintage travel trailer. Make your way to Acoma Pueblo, the oldest inhabited community in North America since AD 1150. It is home to the Acoma Pueblo tribe. The view across the plains are breathtaking, especially if you can catch the sunrise on top of the Mesa. From the Pueblo, through Cubero, visit the Villa De Cubero Trading Post filled with groceries and general supplies. Make a final stop in the New Mexico stretch at Gallup. You’ll want to visit the Rex Museum, a former hotel and brothel in 1900, El Morro Theater, El Rancho Hotel and the old McKinley County Courthouse which contain several New Deal era murals. Head over to the city of Lupton, Arizona and ensure you stop by the Yellowhorse Trading Post, run by a Navajo family who started selling rugs alongside Route 66 in the 1950’s. Make your way past the city of Chambers and visit the Painted Desert and Petrified Forest National Park. The park is a landmark to the Native American culture, where you’ll find Native American ruins and petroglyphs. Hike the many trails along the park before heading to the nearby city of Holbrook. The city boasts many historic buildings, including the Bucket of Blood Saloon and the former Navajo County Courthouse. Explore the many original items from the courthouse and local history of the Navajo culture before finding rest at the famous Wigwam Motel. The motel has seen visitors sleeping in concrete teepees since 1950! Dine at Joe & Aggie’s Cafe in Holbrook and continue forth to Winslow. In the city, you’ll find many Route 66 period gas stations, signs and cafes. Find time to visit the La Posada Hotel, the former 1928 Harvey House hotel and the Lorenzo Hubbell Trading Post and Warehouse that was built in 1917 by the Navajo. Eat at E & O Kitchen before making your way to Flagstaff, the biggest city along Arizona’s Route 66 stretch. The city sits comfortably between mountains and forests. Many 19th-century and Route 66 era buildings still exist in the downtown historic district. Be sure to check out the Lowell Observatory built in 1894, the Riordan Mansion State Historic Park and the Sunset Crater Volcano National Museum. Grab dinner at the Grand Canyon Cafe, a Route 66 era diner opened since 1942 before staying in the 1897 historic Weatherford Hotel. Grab breakfast at Miz Zips and head toward William, a popular place if you want to make a detour and see Grand Canyon National Park off Route 66. If not, explore William and the beautifully restored Pete’s Route 66 Gas Station Museum. Spend some time touring the historical district and discovering the former Frey Marcos Hotel and Sultana Theatre. Grab lunch in Seligman at Angel’s Delgadillo’s Snow Cap Drive-In. Take some time off the road and walk through the gift stores and former Cottage Hotel before settling into Kingman. Spend some time checking out the Arizona Route 77 Museum, an old old power station that served the city between 1907 and 1911. Find steam engines at the Locomotive Park and many hidden Route 66 gems along the city streets. Take a break at Mr. D’z Route 66 Diner before ending the night at the El Trovatore. Eat at Ma and Pa’s Hot Rod Cafe in Kingman before leaving Arizona, where you’ll spend the day exploring the longest section of Route 66. This part of the highway goes through old mining towns and ghost towns of the Route 66 era. Be sure to take extra caution when driving on this stretch due to its winding roads and switchbacks. After a scenic drive, you’ll head to Oatman, a former gold mining town of the 1920’s. Spend the afternoon catching live Old West shows and find live burros along the streets before heading for lunch at the Oatman Hotel Restaurant and Saloon. Bid Arizona goodbye as you cross the border into California, the last state to your Route 66 journey. Before long, you’ll find yourself in the city of Needles. You’ll find many Route 66 era businesses like vintage motels, a train depot and a giant Borax wagon. End your night with dinner at Wagon Wheel Restaurant, while enjoying some live music before heading to bed at the Route 66 era Imperial 400 Motor Inn. Take an early detour up to Joshua Tree National Park and grab breakfast at Crossroads Cafe. 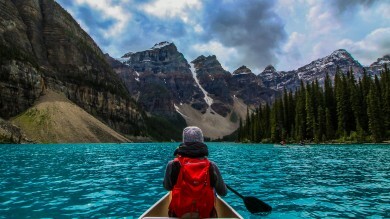 From there, enjoy a scenic drive around the park and if you’re an adventurous heart, try some of the many hikes the park has to offer. Once you’re done, hit the road into the city of Barstow. Barstow is a town worth exploring where you’ll find many of the iconic neon signs and street murals of Route 66. Grab lunch at Rosita’s, a Mexican restaurant dating back to 1954. Find a huge collection of auto signs at Tom’s Certified Welding and Machine Shop, visit the Route 66 Mother Road Museum and a former 1911 rail depot now known as the Casa del Desierto building. End the night at DiNapoli’s Fire House Restaurant and rest at the iconic Route 66 Motel before heading out on the last stretch of your trip. After two weeks of dusty roads, you’re at the end of the trip. The final stretch of Route 66 is all in the timing. Los Angeles is notorious for its traffic, so it’s recommended to arrive at the Santa Monica Pier by early afternoon at the latest. Take a final Route 66 breakfast at Roy’s Cafe in Barstow before making your way to Rancho Cucamonga. Make a quick stop to the local history museum that was once the Cucamonga Service Station in 1915. Before heading back on the road, grab a quick bite at the Sycamore Inn, one of the oldest eateries along Route 66 dating back to 1848. Head over to Pasadena where you’ll find the Colorado Street Bridge and a 19th Century old mill. If you have time, explore the Gamble House, an arts and crafts style house built for the wealthy Gamble family in 1908. Don’t miss a meal at Fair Oaks Pharmacy, before heading to Los Angeles. As you pass Los Angeles, you’ll find yourself going through the neighborhoods of Highland Park, Echo Park, Hollywood and Beverly Hills. Leave some time to spot the 1924 Highland Theater and views of the Hollywood sign. Now slowly head to the end of route 66. The original 1926 terminus was at 7th Street and Broadway. Nowadays, it has been moved to the intersection of Lincoln Boulevard and Olympic Boulevard in Santa Monica. Head down to the famous beach, walk out to the dock before soaking in the west coast waters. You’ve made it! 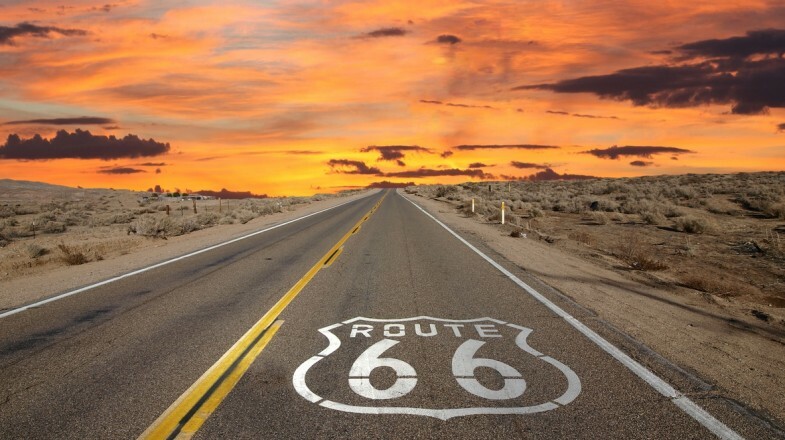 Route 66 originated in 1926 as a network of local roads under the US Highway System. 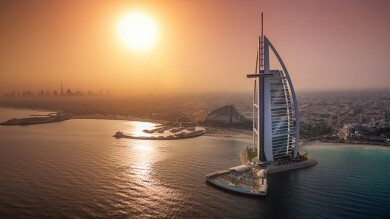 Most of the roads created during that time were not paved, instead only consisting of wooden planks on plains of sand. As time passed, the federal highway system was improved. In the late 1930’s, the original 1926 alignment was given widened, paved paths. The government laid realignments in 1937 (after World War II) and again in 1952. Some of those alignments exist today, while others have been closed due to dangerous roads and closures. Once the artery of the country, Route 66 brought stability and a new way of life to Americans in the 1930’s. Over the years, as more highways became urbanized, Route 66 slowly lost itself within the growing infrastructure of the country. Regardless, Route 66 is still a road that carries meaning to the American people.